Next month we’re going to have a member swap! The project is a zippered bag. Any size, any kind, as long as it has a zipper! If you need any inspiration, check out some of the awesome patterns at your favorite quilt shop or tutorials on line! 1) Write your name on a piece of paper and pin it to a fat quarter that you want your zippered bag from. Put it in a ziplock bag and bring it to the April meeting. 2). At the April meeting, we will blindly draw from all that comes in. 3) You have 2 months to create a work of art for a fellow Vally Modern member! 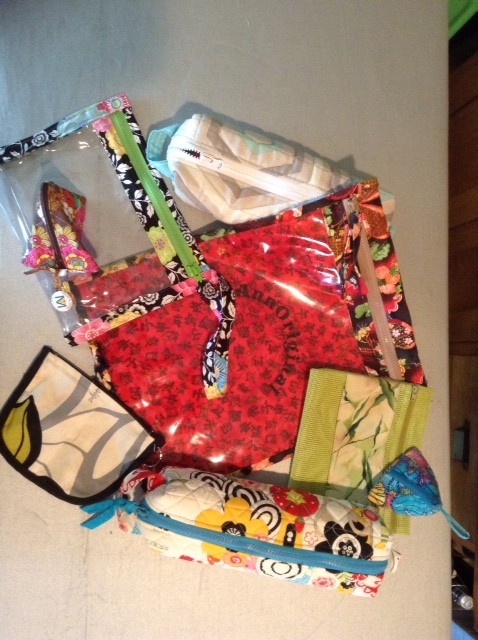 4) You select whatever style zippered bag you want to make. Add fabric, embellishments, vinyl, whatever you want or not. Your choice of zipper is up to you, according to the bag you are making! 5). We will exchange our Zip Bags at the June meeting. If you need any hands on help with zippers or vinyl, come to our April Sew-In for Zippers/Vinyl 911. Bring your own zippers and fabric to practice on!